I recently purchased a Smith and Wesson SW99 from the pawn shop I manage. Upon cleaning, I discovered the ejector was broken off the sear, ordered a new one, put it in, re-assembled the gun, but now I can't pull the slide back. If I press the trigger I can pull the slide back. Also the trigger seemed to be a 2 stage trigger before I replaced the sear. now it's a single stage. I'm not sure if it's the part or if something is off on the trigger. Any insights or advice? Obviously something isn't right. Wrong part, improper install, or maybe both. Hard to say without actually having it to look at. Sounds like the sear is locking up the slide since you can pull the trigger (which disconnects the sear) and the slide will then move rearward. How is the ejector connected to the sear?? How can that be? I would disassemble the whole thing and start over. It was installed correctly, spring attached to the trigger and rolling pin inserted. I was just looking at it and I changed back to the old part and same with the new one. Possibly the trigger needs to be reset? Ok......The EJECTOR is part of the trigger housing. The EXTRACTOR is part of the slide. That is a pic of the EJECTOR. It is a non moving part that simply kicks the EXTRACTED round/case out of the ejection port. So, as long as you can lock the slide rearward using the SLIDE STOP LEVER, so far so good. The EJECTOR isn't interfering with the slide. With the slide locked to the rear, you should still be able to pull the trigger completely to the rear, and it should still return to it's forward position. With the slide completely forward (in BATTERY), and the trigger isn't working properly, it's got to have something to do with the striker lug and the sear not working properly. Like I said, it's kind of hard to guess without having the pistol in front of me to look at. Google S&W 99 Manual and look at the parts schematic. That might help a little. Ok. Thank you for your help, Bowkil. I'll see what I can find out. When I get it fixed, I'll send you a message. Yeah, let me know what happens. I'd like to know what the problem is/was. I have 3 M&P pistols myself. 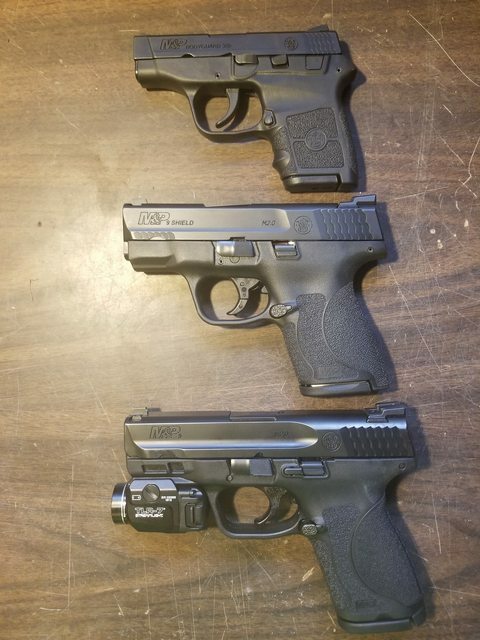 A Body Guard .380, a Shield 9, and a Compact 9 with 3.6" barrel. Both of those are the Mod 2.0 models. Well built and nice shooting pistols. Last edited by BowKil; 11-05-2018 at 06:04 PM.